Yes it's always humid here! About rainfall, summers are pretty dry with some occasional thunderstorms. But air humidity is very high all-year round: at the airport, it ranges from 73% in summer to 82% in winter, and it's higher on the beach or zones that are closer to the sea. At Baltimore's latitude there are also Eureka, California (less than half an inch) and Aomori, Japan (over 300 inches). Again, does this comparison have sense? However, going south on the Adriatic coast the snowfalls tend to be slightly heavier than its northern part. Coastal cities in Abruzzo can see 20 inches of snow in a single snowstorm. You won't find a place with less than an inch of snow/year north of the Jonio Sea's shores. The snow cover of this image is lower than normal. The second half of that month was very mild and the snow fallen in the first half had already melted. Urbino's landscape is not sloping, actually it's pretty gentle and there aren't high peaks nearby; the "stau" (orographic lift) is not as pronounced as in other areas. However, in Urbino around 11 feet of snow (more than 3 meters) fell in four days and cities like Cesena and Forlì, close to the sea, were covered by 2 meters of snow. It has been a very powerful event for that area. Last edited by Troms; 08-24-2013 at 04:19 PM..
That's why this forum is awesome. Always learning. I didn't know those cities average was that low. Interesting stuff! Obviously the Ski resorts and mountains average extremely higher but how about the other side of the Cascades (between the Rockies and Cascades). Do they get more because the Cascades block the warm Pacific air and maybe the cold air from the mountains dive down the slope more? Thanks for this. Excellent details! Naturally italian climate isn't that simply as I've tried to describe due to varied orography and diverse air masses, it's a general and simplified scheme. Another feature of the climate of Rimini and the Adriatic regions is "garbino" wind. Due to the rainshadow effect generated by the Apennines, while atlantic depressions approaching Italy moving eastward, we have this peculiar very dry and warm wind (a sort of Chinook or Foehn). Strong wind gusts can affect adriatic hills and coasts, quickly rising local temperatures, all year round. Since here we usually have high humidity levels, when garbino blows we feel a bit like in the Arizona desert (just kidding). North of Romagna, the south-eastern part of Emilia-Romagna region, the garbino is less frequent, whilst it's common from Rimini to Pescara. As a result of this wind, for example, in the morning of March 18th, 2013, Piacenza and Parma got snowfalls and 0°C, Bologna 2°C and Rimini 18°C! I couldn't believe that only 200 km west it was snowing! Another examples of garbino were November 5th, 2012, when we had 24°C in Rimini, and the 2009 "not-very-white" Christmas, with 20°C and many people relaxing on the beach (at the same time, in Pescara there were 27°C!!!). About average snowfall, the only official data are from 1921-1960. 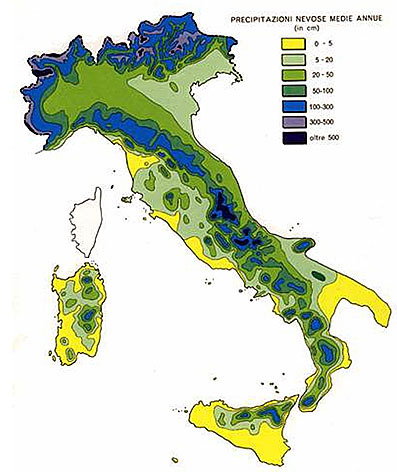 And this is the same map, in a larger scale, of Northern Italy. Rimini is on the bottom right corner of the map. These data are very old, so more recent averages may be a bit different. Whoa, almost missed this thanks to so many threads pushing it back. This is beautiful. Perfect. Thanks! Wish I could give you rep points again. Mar, I don't mean to be rude at all, but these maps are almost useless today. Not in the sense that snowfall averages have become lower; they're just different pretty everywhere. The maps are nice but highly imprecise, especially the first one, being the result of an interpolation from very few stations with snowfall data. They're only useful to have a general overview of the snowier and less snowier areas in Italy, but not for punctual measurements. Last edited by Troms; 08-27-2013 at 10:36 AM..